Fig Belly, poysntixels and Mr. Humphreys like this. Well that was sure nice of you! That packaging is still something else, and I appreciate it all the more each time I see it. Thank you for making grail dreams come true! SB, still alive and making toy nerds happy for mail day in 2018. Fig Belly, Michael Beverage, GoldenArmKid and 2 others like this. I think seeing him so HAPPY, really was very touching! That's my biggest gift! D-.No, Russblue11, poysntixels and 1 other person like this. New G series exclusive colorways sold via Gargamel at the Angel Abbey event (not my pics, click through for more info). A very nice. A very very nice. boon velvet, Vombie, Russblue11 and 3 others like this. Interesting on the G series! Also, the blog shows faces now of the one Mr. H posted the back shot of. Also, what looks like a sketch for a GUNDAM SD! So excited about that, but will take forever to get to me, if ever. Still so excited! Sorry about shouting. There have some new updates. Gundam characters! Very nice!! Wongkingsiu, Michael Beverage and ultrakaiju like this. I totally feel you, though granted I love these two. I imagine - particularly as he is such a fan himself, and has built Gundam models for decades - that he probably feels (perhaps rightly so) that the entire franchise has been almost solely marketed via the mobile suits. This is not wrong, and I see that point of view. But come on, we all love robutts too! If anything I am actually surprised at how incredibly chased his 'human' figures have been; I would have thought the average Gundam fandom representative was not into vinyl so much, let alone dollies of 'em. I think the white Amuro looks better than the blue OG I have... Might we also see a white Gunboy soon...? This army of humans doesn`t seem to be the most ambitious sculpts from him. I am waiting for the white gunboy too. the dude in the white suit is the winner of the bunch for me. Beardy is pretty awesome too. Isnt this the OG and blue was second? Yes. White is the original. The new white one is named again Amuro. I just thought that since the paint app is exactly the same, that it was just the lighting making it look white. All these pics on IG are killin me!!! What's worse is all the buzzing flies, and trying to keep track of them! P.S. We need to update that database! Beautiful new goji in spring meadows colors! Brooklyn_Vinyl, Mark K, Kerk1 and 9 others like this. 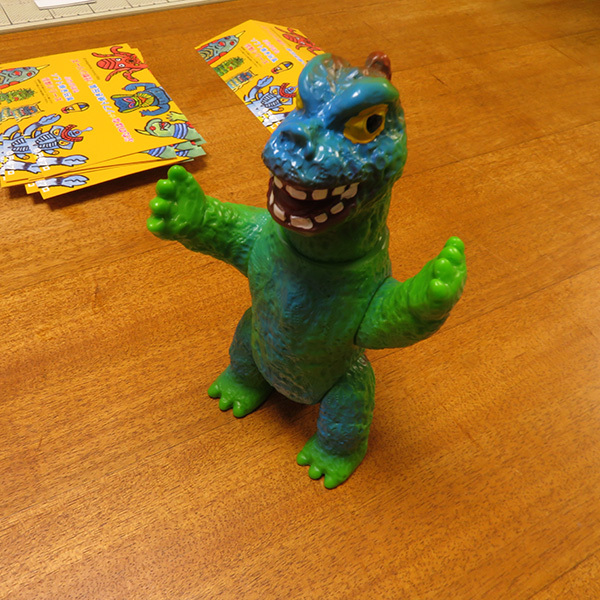 @Mr. Humphreys - Such a great color of vinyl there, a classic for all dino/reptilian kaiju. poysntixels and Biff like this. I’m curious what the headers in the back go to, as well. It isn’t that Goji. Nice to see another round of “full size” Buta.